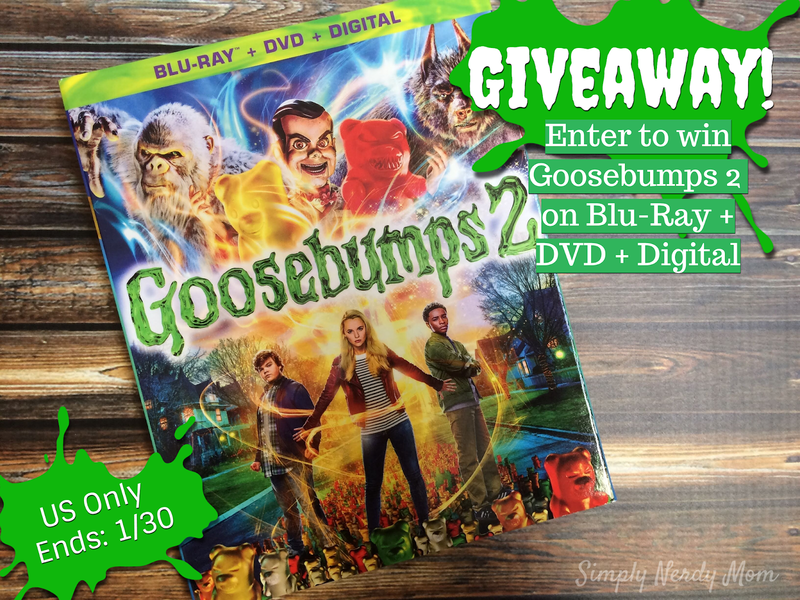 Simply Nerdy Mom: Goosebumps 2 Review & Blu-ray GIVEAWAY! Goosebumps 2 Review & Blu-ray GIVEAWAY! If you grew up in the 90's you'll remember how popular Goosebumps was. It was books, movies, a television show, and had a huge following. Now the next generation is falling in love with all things Goosebumps and fans everywhere, young and old, are going to love Goosebumps 2. I grew up with Goosebumps. I collected the books, had the films on VHS, owned the board games, stickers, bookmarks, calendars, and habitually watched the television show on Saturday mornings while eating my cereal. I actually still have a huge collection of the books in my home library. We loved the first Goosebumps movie and bought it when it was released and we even have a board game from the first movie. So naturally, we were pretty hyped up when they announced the second movie. Goosebumps 2 was released this week on blu-ray and dvd and we had a chance to sit down and watch it. So how was it? I have seen reviews online where the film only got 2 or 3 stars, but we actually ended up liking this one way more than the first. My 12 year old gets bored pretty quickly when it comes to most movies, and she sat through this one, completely glued to the television. We had quite a few laughs and the special features are all really fun and entertaining as well. Goosebumps 2 is a sure fire hit with everyone in the family. Slappy the dummy is back and looking for a family. When things don't go his way, he brings Halloween to life and it's up to siblings Sarah and Sonny, and Sonny's friend Sam to stop Slappy from carrying out his evil plan. With a cast of favorites such as Wendi McLendon Covey, Chris Parnell, Ken Jeong, and Jack Black reprising his role as R.L. Stine, you will be laughing non stop. The Bluray - Dvd Combo pack is full of tons of special features that are perfect for more movie night fun after the film has ended. My favorite Goosebumps book is night of the living dummy. Say Cheese and Die! is one. I have not read any of the books. i did as a kid but im not sure of any of the titles... loved the movies though. I have never read this before. I have read Goosebumps to my nephew when he was younger. But I do not remember any of the titles as he had quite a few as I recall. I have not read any of the Goosebumps books, but my grandchildren have! My daughter and I read Revenge of the Living Dummy. Awesome giveaway! my daughter would love if I won. Thanks so much for the chance. I read them when I was younger but that was way too long ago to remember which was my favorite. Yes I read a lot of Goosebump books when I was younger - now my daughter enjoys reading them!